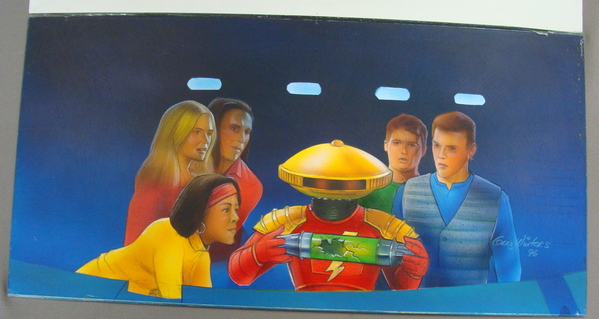 Original painting from the Graphic Novel by Scott Peterson and illustrated by Greg Winters. This is the actual painting which was used in the book. This is the original painting, one of a kind. This was painted in 1996. The dimensions are 20" by 10"
The painting is on premium art board and in excellent condition. Other clients include the NFL, the video game industry, Star Wars toys and games for Lucas arts, Star Trek and many sci-fi pieces for different uses, many toy companies advertising agencies and publishing. He has worked directly with Author Services to produce several original airbrushed volcano paintings for Dianetics (hard and soft covers), and many covers for Missionand Battlefield Earth hard and paperbacks and other Scientology publications.